After Hurricane Katrina came, Hurricane Rita followed soon thereafter and damaged much of the gulf coast of Texas. I went along with a volunteer medical team to help victims in the greater Houston area. Our team gave shots, medicines and tried to help many who needed to see a doctor or nurse about medical issues for adults or children. That week, while I was there, a friend and I stayed with some wonderful folks we had never met before. They had a lovely home with a swimming pool in the shape of the state of Texas! Susan had several church cookbooks laying around. While I was there I copied out some recipes that looked like they would be worth trying sometime. Ranch Pork Chops was one of those recipes. It has been almost a decade that I’ve had this recipe in my cookbook binders to try. I’m really glad I finally got around to making it. We have a friend in our Sunday school class who recently lost her father. She ended up staying with her mom in Arkansas sorting out a lot of her father’s things for a month. I knew when she got back she’d be exhausted so I offered to bring them a meal. Ranch Pork Chops, Carrot Raisin Salad, Greek Tomato Salad, Tossed Salad with Tropical Fruit, (yes, she loves salads! ), Herbed Biscuits and Chocolate Butter Pecan Pound Cake were all on the menu. I thought the sauce for Ranch Pork Chops was amazing. Quite frankly, I don’t see why you couldn’t use the same sauce for chicken, lamb, or even fish! Although, I probably wouldn’t pre-fry chicken or fish and probably won’t fry the pork chops next time I make them. But they did have a nice brown texture from doing it. 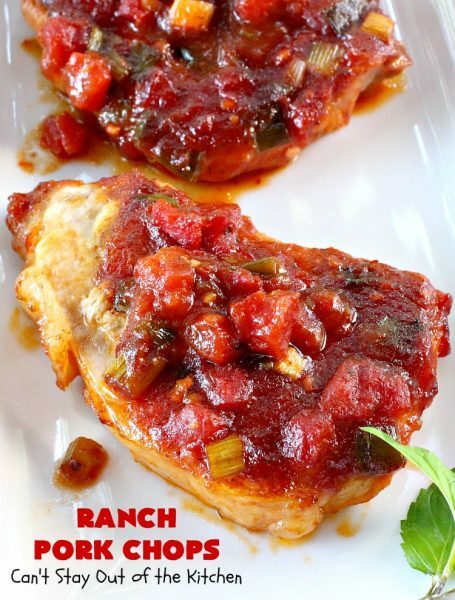 If you’re looking for a tasty way to make pork chops, then you need to make Ranch Pork Chops! The flavor of the chops is spectacular. But as I said earlier, I think this would probably work better with really thick chops. Enjoy. 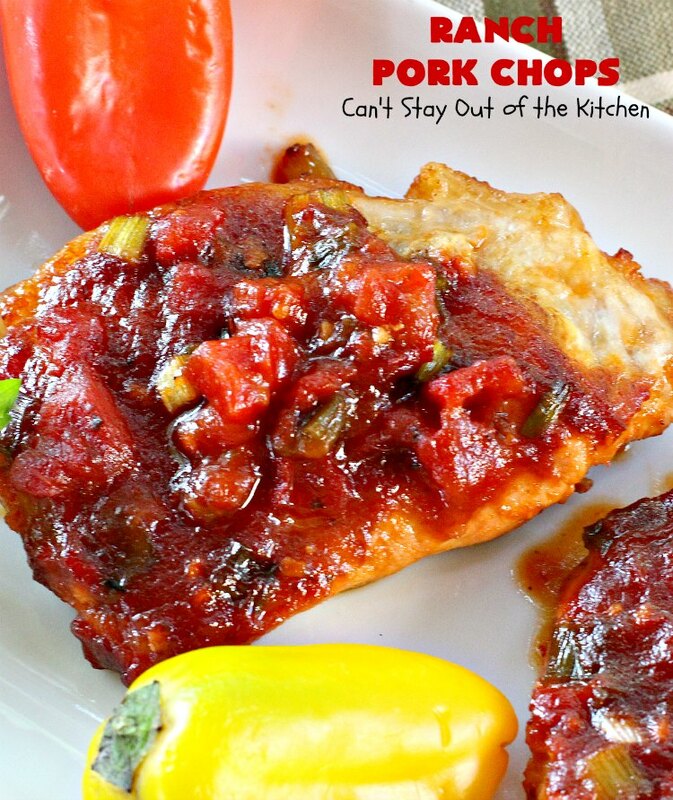 Ranch Pork Chops are scrumptious. Consider trying this sauce recipe with lamb chops, chicken or fish! 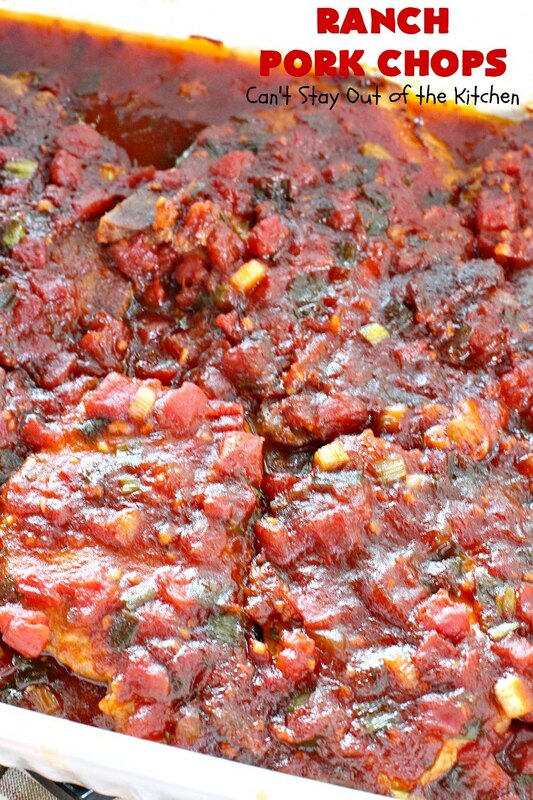 This close up allows you to see the texture of the sauce. It was marvelous! Each bite is so succulent and delightful. 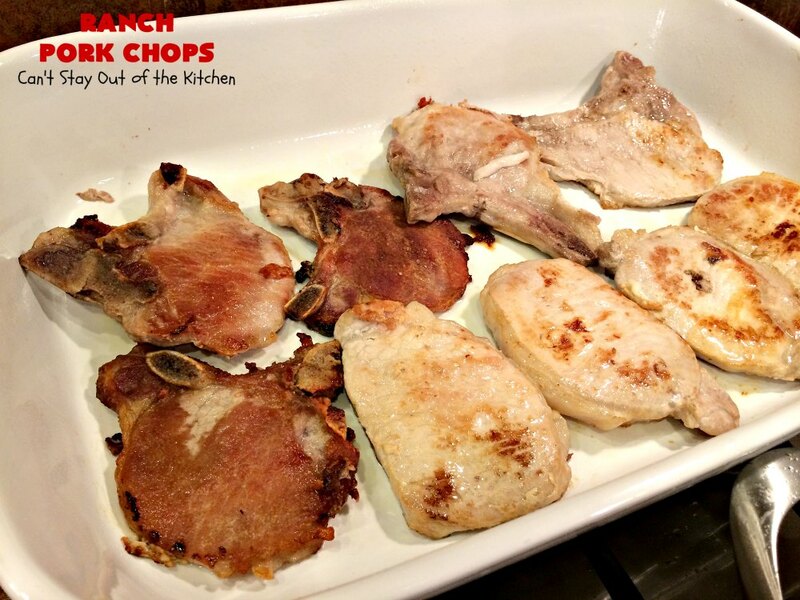 Fry pork chops in hot oil for about 5 minutes per side until lightly browned. Spray a large glass baking dish with cooking spray. Place fried pork chops in dish. If you want to eliminate this step just put the chops into the pan raw and bake a little longer to ensure the meat is cooked thoroughly. Make Ranch sauce: Place chili sauce, Ranch dressing mix, diced tomatoes with green chilies, plum jelly, green onions and garlic in a large saucepan. Allow mixture to come to a boil and simmer 5 minutes until sauce has thickened. 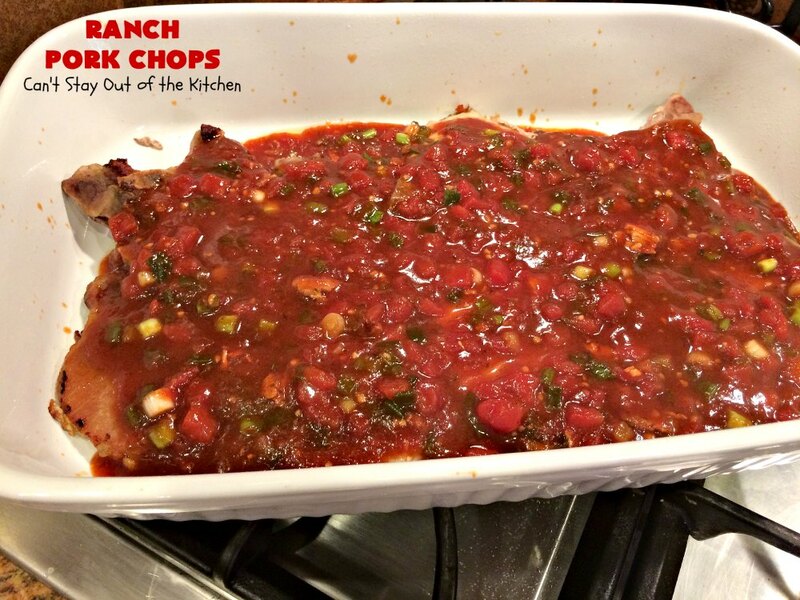 Pour Ranch sauce over top of pork chops in baking dish. Cover with foil and bake for 1 hour at 350. 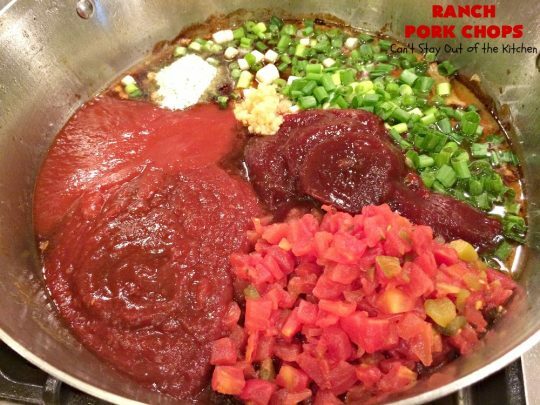 (Increase cooking time if using raw pork chops). Here the pork chops are done. Serve on a serving platter and garnish with more of the sauce if desired. Ranch Pork Chops were really easy to make. If you eliminate the frying step they are even quicker and easier to prepare. 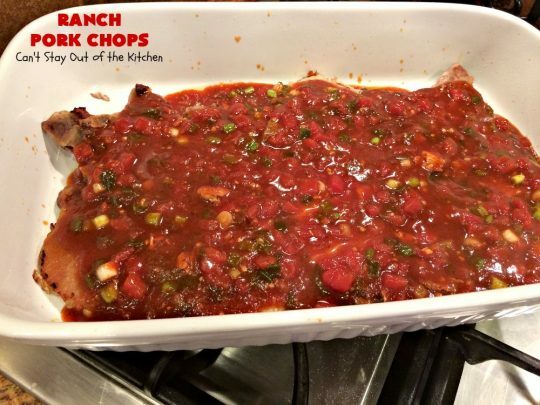 Don’t Ranch Pork Chops look mouthwatering? 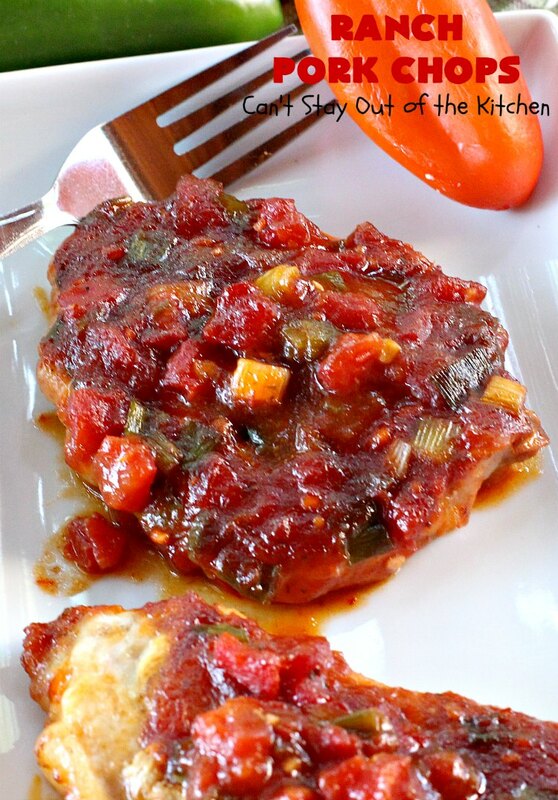 Tasty pork chop main dish with a sauce consisting of Ranch dressing mix, chili sauce, diced tomatoes with green chilies, plum jelly, green onions and garlic. 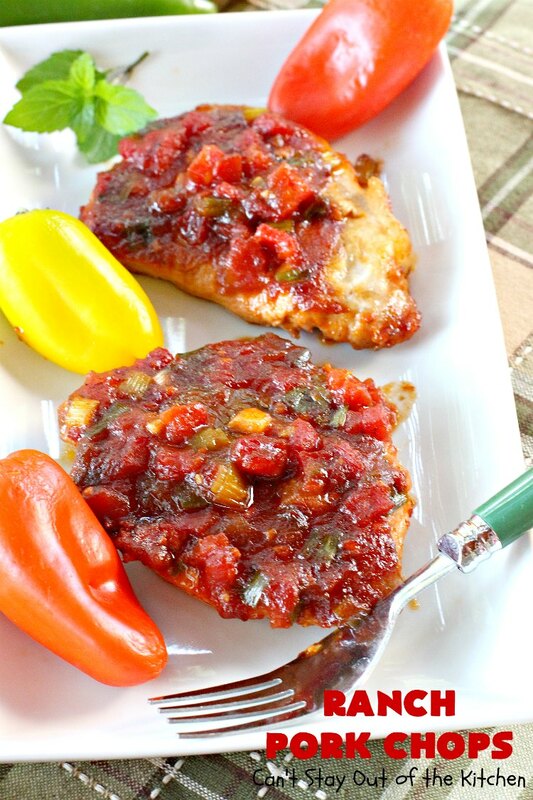 Terrific entree for family or company dinners. In a medium skillet, brown the pork chops in the oil. Then place the chops in a buttered 10x15” glass baking dish. 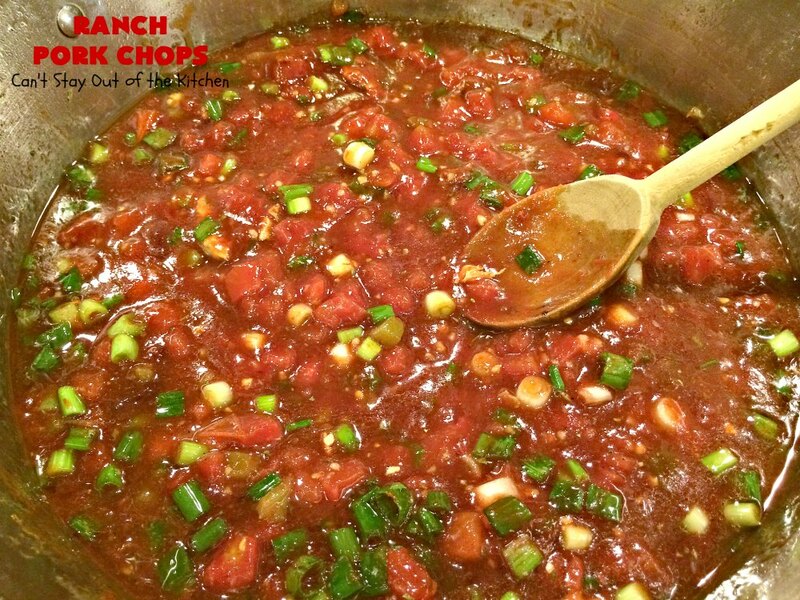 In same skillet, combine the chili sauce, Rotel tomatoes with diced chilies, jelly, dressing mix, green onions and garlic. Let this mixture come to a boil and simmer 5 minutes until thick. Pour over pork chops and bake, covered, at 350° for 1 hour. NOTE: You can eliminate the frying step by placing raw pork chops in a greased baking dish and baking until chops are cooked through. Check with a meat thermometer. NOTE: This sauce can also be used on chicken, lamb chops, and fish, if desired. 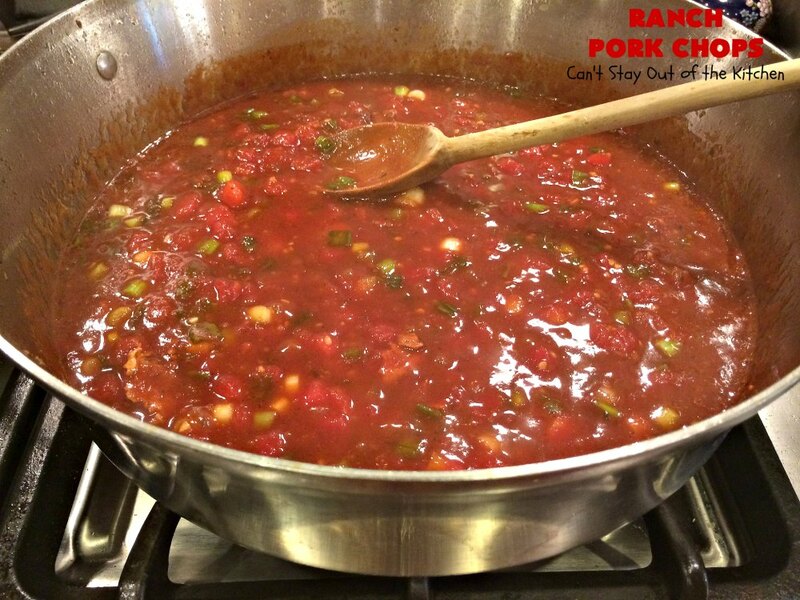 NOTE: The sauce in this recipe is actually enough for about 12 pork chops or 12 boneless chicken breasts. Tasty pork chop main dish with a sauce consisting of [url href=”https://www.hiddenvalley.com/” target=”_blank” title=”ranch dressing mix”]Ranch dressing mix[/url], chili sauce, diced tomatoes with green chilies, plum jelly, green onions and garlic. Very tasty. Then place the chops in a buttered 10×15” glass baking dish. 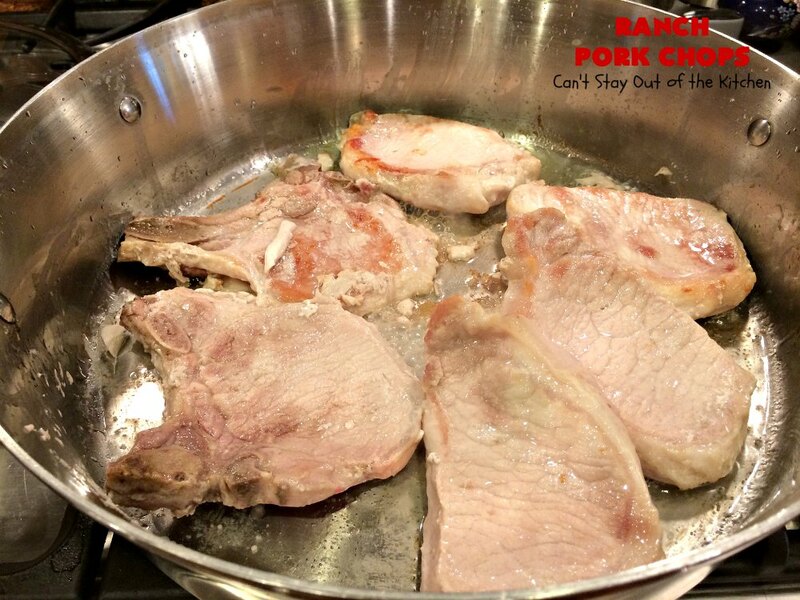 You can eliminate the frying step by placing raw pork chops in a greased baking dish and baking until chops are cooked through. Check with a meat thermometer. 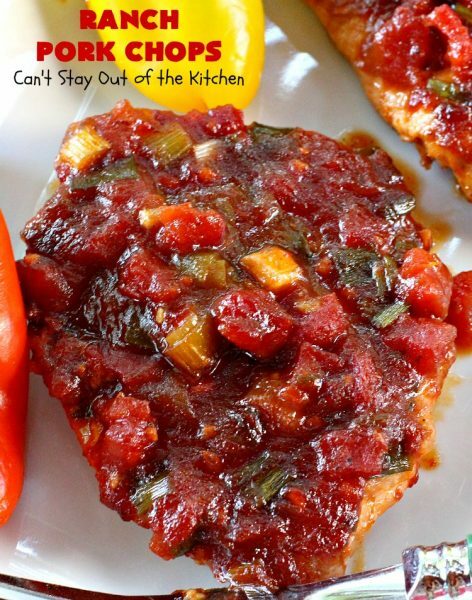 [br][br]This sauce can also be used on chicken, lamb chops, and fish, if desired. 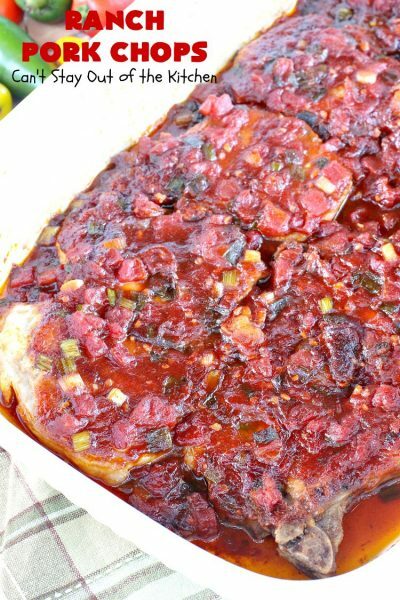 [br][br]The sauce in this recipe is actually enough for about 12 pork chops or 12 boneless chicken breasts. Ranch Pork Chops is a great recipe for company, too. Yes! These were amazing. That was a wonderful dinner, Teresa. We are seriously indebted to you. Eating on that meal for most of the week, helped me so much. Blessings to you!! Thank you, Linda. It was my pleasure. I’m so glad you enjoyed everything!